Germany coach Joachim Loew's decision to axe Bayern Munich defender Mats Hummels and teammates Thomas Mueller and Jerome Boateng have not gone down well with the players and they felt disrespected. Veteran German defender Mats Hummels was amongst the three players alongside colleagues Thomas Mueller and Jerome Boateng to be axed from the national team duties. 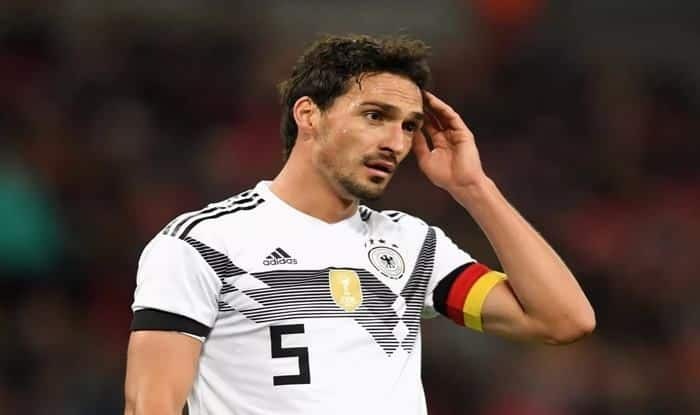 The decision came as a shock to all of them but the Hummels insists that he does not bear any grudge over the German team coach Joachim Loew. “I myself do things that other people aren’t happy with, so I am not resentful about decisions other people make which have an effect on me,” Hummels said in an interview with Sport Bild magazine on Wednesday. Loew’s decision to send the experienced Bayern trio into international retirement sent shockwaves through German football three weeks ago. The Germany coach faced heavy criticism for the way he had communicated the decision, with Mueller saying that Loew had shown a lack of class. Hummels, though, struck a more conciliatory tone on Wednesday. “It was impossible for Loew to find the perfect way of informing us,” he said. “It was probably difficult for him to find a way in which we could all leave the discussion feeling like everything had been done in the right way.” The 30-year-old admitted that Loew’s decision had been difficult to take, but said that he is not looking back in anger at his international career. He did confess, however, that he has one major regret from those eight years. In last summer’s humiliating World Cup defeat by South Korea, Hummels missed a golden opportunity to score late in the game. Had his header found the net, Germany would in all likelihood have avoided a painful group-stage exit. “I’ve discussed that moment time and again with my friends. The header against South Korea had such an enormous effect, not only on the World Cup but also on what is happening now. “If I had scored, then we would have gone through and a lot of things would have turned out differently.” While he has not ruled out a return to international duty, Hummels said he is now looking to put the past behind him and focus on Bayern’s Bundesliga title defence, which continues away to Freiburg on Saturday. “The Mats Hummels who plays for Germany has been pushed aside in my head for the time being,” he said.